"We are very lucky because the world is in a big transformation because of technology. This new technology will create a lot of successful people, interesting careers but honestly every new technology will create social problems. "If we don’t align together, human beings are going to fight each other, because each technology revolution makes the world unbalanced." "To gain success a person will need high EQ; if you don't want to lose quickly you will need a high IQ, and if you want to be respected you need high LQ - the IQ of love." "If you want your company to be successful; if you want your company to operate with wisdom, with care, then women are the best. "37% of senior management in Alibaba are women. Part of the 'secret sauce' of our success is because we have so many women colleagues." "I think globalization cannot be stopped - no-one can stop globalization, no-one can stop trade. If trade stops, the world stops. Trade is the way to dissolve the war not cause the war. "Global trade must be simple and modernised; it must be inclusive so everyone has the same opportunity. The next generation of globalisation must be inclusive." "Artificial intelligence, big data is a threat to human beings. I think AI should support human beings. Technology should always do something that enables people, not disable people. "The computer will always be smarter than you are; they never forget, they never get angry. But computers can never be as wise a man. The AI and robots are going to kill a lot of jobs, because in the future it'll be done by machines. Service industries offer hope - but they must be done uniquely." "Learn from your mistakes - no matter how smart you are you will learn from them. We must share the mistakes with others. "My thinking is that - if you want to be successful, learn from the other peoples’ mistakes, don’t learn from success stories. 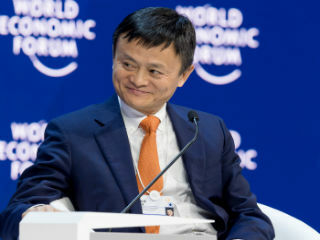 The book I want to write is "Alibaba: 1,001 Mistakes". "You don’t need to know a lot of things, but you need to find the people who are smarter than you are. My job is to make sure smart people are working together." "The best way to promote your company is through your product or services, or employees." "A teacher should learn all the time; a teacher should share all the time. Education is a big challenge now - if we do not change the way we teach thirty years later we will be in trouble. "Google, Facebook, Amazon and AliBaba - we are the luckiest companies of this century. But we have the responsibility to have a good heart, and do something good. Make sure that everything you do is for the future."